Americans United for Life is calling Elena Kagan, whose confirmation hearings begin in a week, a "pro-abortion activist." Unfortunately, actual abortion-rights activists are far from convinced. 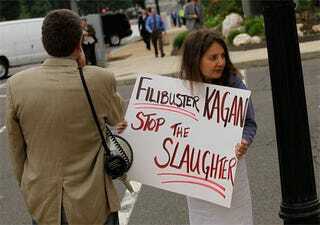 Kagan's record documents her agreement with the general proposition that the Constitution affords a right to abortion. Her positions on the specific contours of that substantive right are less discernable. Indeed, some of her writings raise questions about the depth of her consideration of the significance of reproductive rights to women's health, lives, and equality. That said, only speculative conclusions can be drawn from the record given the limited, and at times political, purposes for which the memos at issue were written, and the length of time since she authored them. Accordingly, it is critical that the Senate inquire into her current views on constitutional protections for abortion rights more deeply through the confirmation process. Just about every conversation about Kagan trails off at the caveat that no one really knows anyway, because that was a long time ago and she was writing in an institutional voice. Guess we'll all just have to wing it! Twenty-five years later, attitudes about abortion are a lot more nuanced. Just about every woman has seen her own or someone else's sonogram, and it's not so easy to insist that no laws need apply. Younger women have a more complex view of abortion, and they don't view the issue as passionately as their mothers. It's the definition of pro-choice that is evolving under Schriock's leadership, and it apparently will be a lot more flexible than was the case when Malcolm was at the helm, reflecting the changing times and the scientific advances that have clouded the issue. The Emily's List candidate questionnaire is not a lengthy document that asks a candidate to pledge support to very precise and extreme positions. It's about commitment to Roe v. Wade, and for most Democrats, men and women, that's an easy threshold to meet. Today – as has always been the case – we stand firm in our belief that the government has no role in this most personal of decisions. That is what EMILY's List and our extraordinary women elected officials have always fought for – and always will. This is somewhat reassuring, but it's still unclear what some of the terms in Clift's original piece really mean. And as we see from Kagan, maybe the "changing times" mean having a conversation while saying as little as possible.